Seriously. Who knew that 3 weeks traveling abroad, followed by back to back road trips to help family and friends get settled into new apartments and places would result in an early run-in with the flu? I guess I over did it? I just returned from Boston on Sunday at 11:00pm after a whirlwind 25 hours of full on crazy. My dear little cousin just moved to Boston to start work a couple weeks ago… and since she has been swamped with work, we planned a quick trip to get her settled. We did 7 hours of bargain hunting on Saturday night and outfitted her with new towels, sheets, a foam mattress topper, mirrors, work suitable clothing, cute shoes, and a million other odds and ends. At the end of the trip it took us 4 trips from my car to unload and unpack. At midnight, we finally had finished, slapped on some crazy party makeup and zipped into little dresses before we were out dancing…. and then we met some random people and partied until the sun came up. Weird? Probably. After a quick nap, J and I were back to bargain hunting to finish outfitting her place. The minute I got her settled, I hopped in the car and drove home as the sun set. I woke up on Monday feeling a little under the weather. After walking my dog and breaking out into a cold sweat, I determined that I was indeed sick. Fever, chills, and some major crankiness later… I’m feeling better. So. Happy Friday. I’ve slept away the entire week to battle my cold. The cutest little cup holder… It’s a little bear! Is Dunkin Donuts this cute in the United States??? 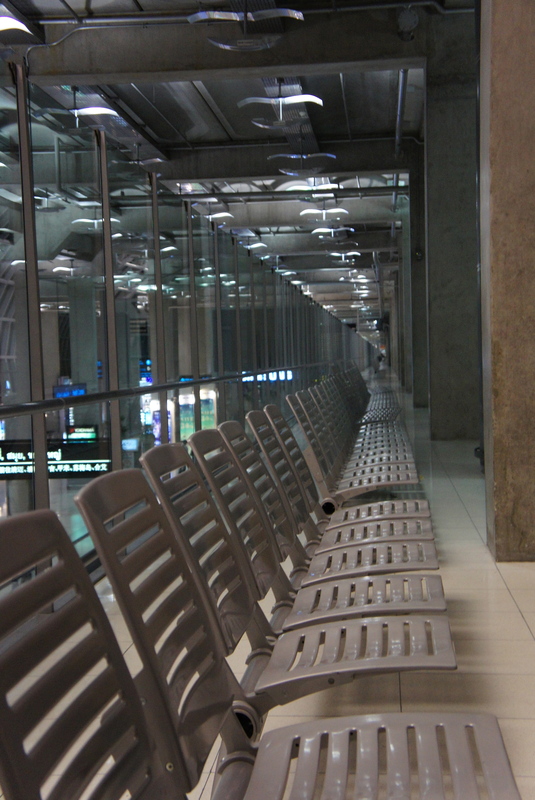 Bangkok International Suvarnabhumi Airport at 3:30am…. Completely empty! !